There will be about 50 or so heart pieces to find. Bosses now re-spawn as part of the new boss rush, so they no longer drop full heart containers. 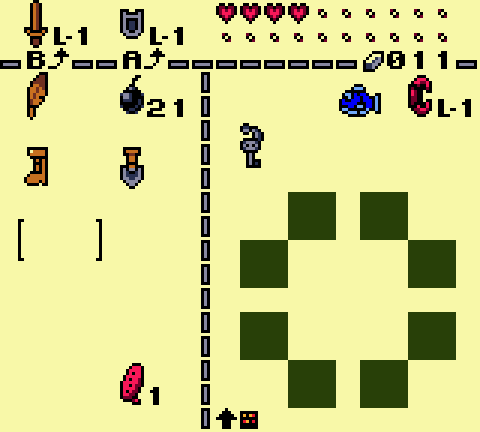 In the original game, being limited to 14 hearts, and having 11 of those basically given to you, always felt like such a let down to me. I wanted to explore more with more things to discover, so now you'll have about 5x as many hearts to find (with 5 pieces making a complete heart), and even more seashells, as well. I've tested the amount of hearts and seashells over the years and finally settled on a quantity that feels reasonable and not overwhelming. For seashells it started out at 100, but over time, that felt like way too many, and I even lost interest in finding such a large number. It might've worked in a larger world, but in a world this size it greatly reduced their appeal after a while, especially on repeated play throughs. This subject is quite hard to explain, but as someone who has played this way a lot, you'll just have to trust me, ha ha. Before starting this hack, I was like "oh yeah! 100 seashells! woo hoo! ", but it turns out to not be so great. There will be more opportunities to spend more time with the game, as you said. I'm trying to design the world in such a way that areas will serve more than one purpose. There will be backtracking, but it will all be optional and never required. So if you are willing to explore and see what there is to offer, I'm sure you'll find plenty things to keep you occupied. One last thing, Exodus you mentioned "soon" but I just want to clear things up a bit. While I did say 90% complete as sort of a progress indicator, the scale of this project is quite huge so even that last 10% will take time. I'm always working on this when I have free time, so it will be finished eventually, but it's hard to say when that'll be. I think around 50 heart pieces is a reasonable amount, which can still be motivating to find all without loosing interest. Regarding the boss rush mode, does that mean you can fight a boss multiple times to gain more than one heartpiece from a boss? I can understand your thinking of not oversize the number of heartpieces and seashells to find. It is better to keep the number a bit lower and the motivation higher. I am really exited about the new things and sidequests you have planned. I am sure they are going to be great. Sorry if I sounded to demanding in my previous post. I know that you do all of this work in your spare time and it is a massive project to finish. Please take your time to finish it in the same quality the already existing parts of the game seems to be, even if it is really hard for me to wait for this. I feel like a little child on christmas waiting for my parents to allow me to unwrap the presents. It is awesome nontheless that you are provinding regular headups on your work. Please continue doing so. It calms my mind while waiting for this. Agreed, this is looking really good! I know I can see the practicality in utilizing more of the map, when such a complex map as Awakening had so few things per screen (compared to Oracles anyway). 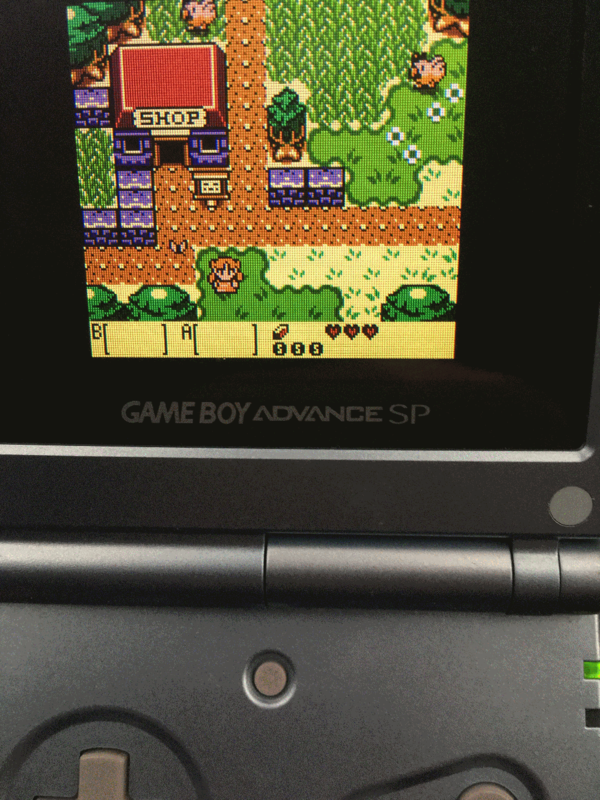 I'll certainly appreciate playing a more gold version of Link's Awakening. I know it should be obvs btw, but I take it this is applied to ye olde Link's Awakening and not DX? I'm cool with it either way, just curious is all. Just was wondering how the hack was going. have you been able to keep working on it or has it taken a bit of a back seat to real life stuff ? I really hope this project hasn't died. It looked very promising but IcePenguin hasn't been online for about half a year. Hope he is ok. Sorry to make you all worry! This project is still alive, but progress it quite slow. I've been well preoccupied with boring life stuff most of last year. I hope you all understand, and just wanted to let you know I am determined to finish this hack! Made some progress over the weekend. It's something I've wanted to implement for a while now, and finally, I have done it! Every adventure needs one, right? Not sure if I mentioned this before, but there are 3 sword upgrades now (4 total swords), each with different properties. It's looking great IcePenguin. I'm looking forward to this. The major difference is removing the rupee counter from the main HUD, in option 2 & 3, and only having it in the inventory screen. 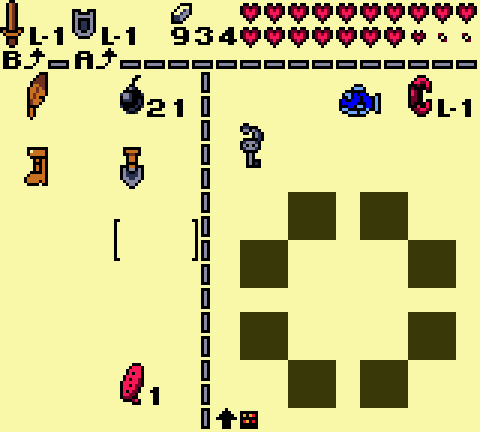 Meaning, as you collect rupees, you won't immediately see it update the counter. What are your thoughts? I like it, specifically the second example. It looks more smooth and since nothing else would be taking up that space, it gets ruppees out of the way entirely. Nicely done! Option 2 seems best, though it feels a little wierd. So I'll change my vote to Option 4: Removal. Personally I like option 3 better, with the rupee counter nearer the heart counter. 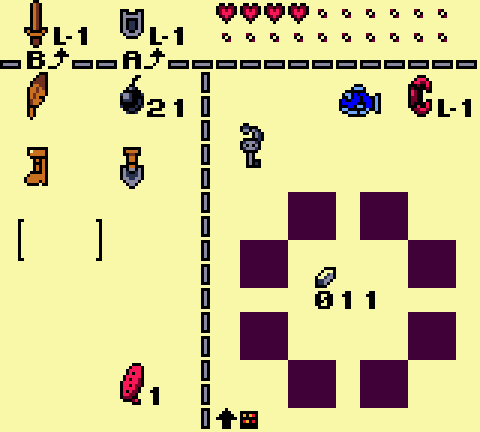 The only time I can think of a need for a rupee counter to be available at all times would be if you're grinding to save up for an expensive item. (I remember doing it for the bow in original LA way back when.) I wouldn't want to keep popping back to a town to visit a shop to see how far I've got to go.